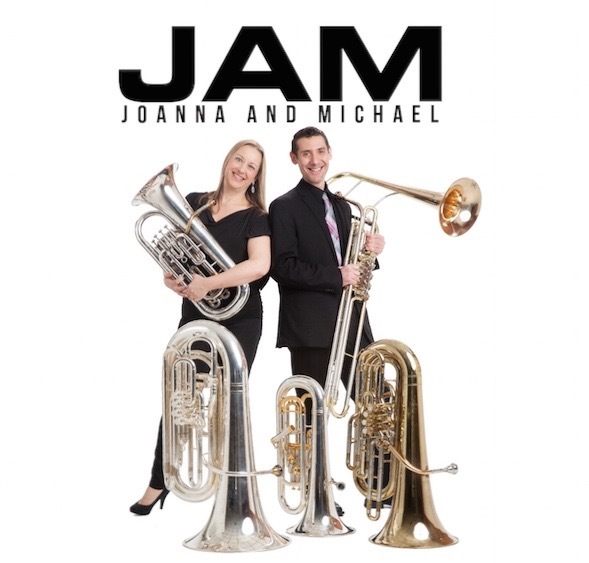 “JAM is a highly skilled brass duo, entertaining listeners with traditional and modern flavors. Tom Holtz composed his Three Grooves for Two Tubas for himself and Joanna in 2013, and they were premiered at UNC Pembroke in January 2014. Tom and Joanna met for the first time when she arrived as a young freshman at Arizona State University’s Sun Devil Marching Band Camp, where Tom was Sousaphone Section Leader. From that point on they have performed together, continuing as they both became military band musicians. A native of Geneseo, Illinois, Tom received his Bachelor of Music Degree from Arizona State University before beginning his career as tubist with “The President’s Own” United States Marine Band in Washington, D.C. Tom is an active freelance musician and arranger in both classical and jazz venues across the mid-Atlantic region. We are so grateful for Tom’s compositions, which are published with Potenza Music, and are available in euphonium as well as tuba versions. Hildegard von Bingen was a German abbess, mystic, writer and composer. Given to the Catholic Church by her parents at the age of eight, Hildegard flourished under the creative atmosphere she found there, writing lyric poetry, biographies, works on medicine, natural history, and accounts of her personal mystical experiences. She is perhaps best remembered for her musical compositions intended for use at the convents, many of which have been preserved. In O frondens virga (“O greening branch”) Hildegard reminds us that each day and season starts anew, and with that we too are able to begin again in the grace of God. Joanna’s arrangement sets this tuba solo into an electronic framework jointly composed by Joanna and Bill Bendrot, allowing the juxtaposition of Medieval overtones with contemporary soundscapes. Kevin McKee’s music has been performed extensively throughout North America as well as in Europe, Asia, Australia, Africa, and South America by groups such as the National Symphony Brass Quintet, the Philadelphia Orchestra Brass Quintet, the Dallas Symphony Brass Quintet, the Navy Brass Quintet, U.S. Army Trumpet Ensemble, Tromba Mundi and the All-Star Brass Quintet featuring brass greats Jens Lindemann, Ryan Anthony, Marty Hackleman and Patrick Sheridan. A Winter’s Night published for trombone and piano is dedicated to Kevin’s father, a trombonist and a great musical influence. With the composer’s permission Michael has adapted this work for cimbasso. Anne Hunter was a Classical era poet and composer centered in London, and is known today mainly for working with Franz Joseph Haydn, having contributed the text for several of his song collections. Anne published poetry and song cycles during her lifetime, and held highly successful musical salon gathering at her home. In 1782 she composed a set of seven dances for violin and piano that call to mind her Scottish roots, which Joanna has arranged to feature tuba, euphonium and cimbasso. Amnon Wolman is a sound artist and a composer whose work is grounded in a belief that music as an art form expresses many dissimilar ideas of beauty. He works in four arenas: sound art, performance sound-art, composition and collaborative projects. Amnon’s interest and involvement in technology and in issues of time-information guide his work alongside long-standing interests in the creative process, the relationship between a performer and the artist, and collaborations. Amnon was commissioned by Michael to write Assembly Point for tuba and electronics specifically for this album. The text heard in the electronics is sampled from various recordings of Michael reciting a poem he had written at the age of seventeen shortly after his eldest brother died from HIV-AIDS. The electronic part also contains samples of Michael playing tuba and didgeridoo which are layered into the overall texture of the track. The work will guide the listener through a varied emotional states and raw feelings. Giussepie Verdi was one of the great Italian opera composers of the nineteenth century and to this day his operas are performed with vast frequency. Verdi holds a soft spot in the heart of every cimbasso player as the instrument was created at his request. The cimbasso is called for in most of Verdi’s works, including the work’s of his contemporaries, most notably Puccini and Bellini. “Dio, che nell’amor infondere amor” from Don Carlos is a duet between Don Carlos and Rodrigue as they pledge their everlasting faith in the ties of their friendship. On this arrangement Joanna (euphonium) portrays Don Carlos while Michael (cimbasso) portrays Rodrigue. A leading musical artist in Classical Europe, Chevalier de St. George (Joseph de Bologne) was a dashing figure who excelled at the violin, in addition his love of sports, also becoming a fencing champion. Born in the French West Indies, his father George was a plantation owner and his mother, Nanon, a slave of African descent. Joseph grew up embraced by his father’s household, and was trained in all the skills necessary to young upper-class men of his time. In Europe, he composed numerous string quartets and concertos, the level of which was often compared to his contemporary, Mozart. This Andante, arranged by Joanna for tuba euphonium quartet, is taken from a concerto for solo violin and orchestra composed in Paris in 1774. “The Long Black Veil” is a popular country ballad by Danny Dill and Marijohn Wilkin. The song was first recorded by Lefty Frizell and since has been recorded and performed by: Johnny Cash, Joni Mitchel, Joan Baez, Bob Dylan and the Band, the Grateful Dead, Social Distortion, Nick Cave and the Bad Seeds, Bruce Hornsby, Emmy Lou Harris, Dave Matthews Band, Bruce Springsteen, Jerry Garcia, and now JAM- Joanna and Michael. The song tells a story of a man falsely accused and executed for murder whilst he refused to divulge his alibi, as it would also confess him to an affair with his best friend’s wife. The grief taken woman visits her lover’s grave wearing a ‘Long Black Veil. A legendary figure of performance, education and composition in the low brass community, John Stevens is one of our most commonly programmed composers for tuba and euphonium. His Ballade, composed in 1990, is a work suitable for many levels of performers, featuring long lyrical lines and shifting harmonies. Though one of his lesser known works, this quartet’s beautiful chordal structure has made it a favorite of ours and has been a joy to record. This work is published by Medici Music Press.